나트랑, 베트남의 써니 호텔 - 나트랑 | 호스텔월드에서 예약하세요. Cancellation policy: The guest will be charged the total price if they cancel anytime. With a spectacular list of comforts and a hot location by Beautiful Sandy Beach, the Sunny Hotel is a choice destination for global backpackers and leisure travelers alike. Guestrooms feature everything from screen televisions to 24 hour room service, dining is available on site and there are incredible meeting and event spaces suitable for everything from board meetings to grand banquet events. This premiere hotel is perfect for those looking to enjoy a holiday in a beach city. The branch new Sunny Hotel is a popular Three Star deluxe hotel/property/accommodation and situated within the center of the best and world-renowned bars/pubs, sightseeing and restaurants that Nha Trang has to offer. While keeping rates affordable, the Sunny Hotel seeks to create an environment in which people enjoy the comforts of home, while being transported somewhere special. The Sunny Hotel is situated just 3 minutes to the beach and provides a convenient gateway to the rest of Nha Trang and its amenities. With air conditioned rooms, Wi-Fi, a harbor view rooftop swimming pool and a diverse friendly staff fulfilling your every need, this hotel is a great choice for everyone. 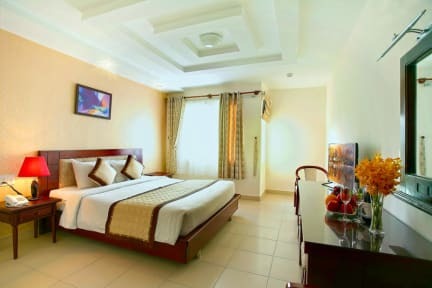 The Sunny Hotel offers an arrange of various activities like island trips, scuba diving, city tours, car rentals, visa arrangements are also available at a very economical rate. The hotel is 45-minute drive from Nha Trang ( Cam Ranh) Airport.